Street scene in eastern Cuba, early ’90s. A man who believed himself bigger than life was buried in a tiny casket today. At first, I found it unseemly, the street celebrations by the Cuban enclave in Miami, upon the news of the death, at long last, of Fidel Castro. As a Cuban-American — and resident of Miami since infancy, as my parents were exiled concurrent with the Cuban Revolution in 1959 – I felt a curious detachment from the revelry, perhaps having already experienced it in my mind on the several occasions when rumors of the bearded one’s demise erroneously spread like wildfire in the community. It all seemed like a predestined ritual, a pent-up paroxysm of emotion amongst those genuinely aggrieved (and some just along for the ride), a moment awaited for what seemed like centuries. Since I’ve had use of reason, Castro loomed large over existence; rare was the family dinner where his name didn’t somehow manage to infiltrate the conversation. And the stories. And the memories. And always, the sadness. So I don’t begrudge the celebrants their moment. It was a long time coming. He was buried, ironically, near the resting place of the great Cuban poet and patriot José Martí. 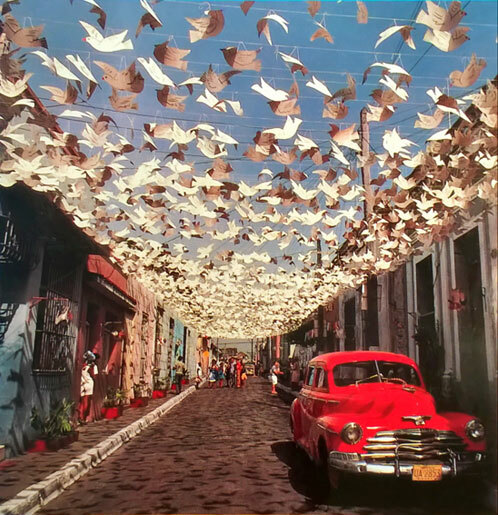 Would that Castro had heeded Martí’s timeless words, “The general happiness of a people rests on the individual independence of its inhabitants.” One can continue to hope. In Wolf Hall, the acclaimed series based on Hilary Mantel’s award-winning books about that Machiavellian manipulator of Tudor politics, Thomas Cromwell, the atmospherics consist of shadows. With sets lit only by candlelight and looking like something out of a Rembrandt painting, it brilliantly captures the dark and tangled web of intrigue, deception, and betrayal that characterized one of the most discussed periods in English history. I left a comment the other day on the New York Times blog that’s been providing a weekly recap of the episodes, where I took umbrage with the writer’s observation that Wolf Hall is “Showtime’s ‘The Tudors’ without the bare breasts.” To compare that mayhem of outrageous historical license with this effort is — to hurl a common epithet from the Tudor era — heresy. 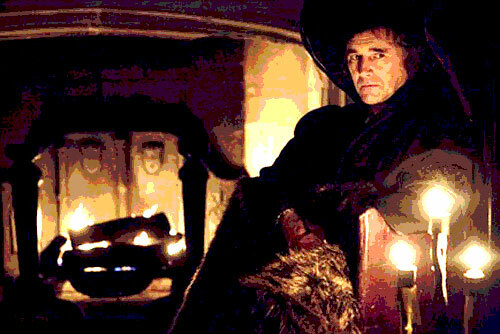 The Cromwell of Wolf Hall is keenly self-aware of his more devious personal traits (“Born sneaky. Can’t help it,” he impishly imparts at one point) yet is seemingly more wise pragmatist than cutthroat predator. Born of a blacksmith father who inflicted horrific beatings on a terrified son, losing a beloved wife and two daughters to the dreaded “sweating sickness” that played roulette on the English people throughout much of the 16th Century, Cromwell had seen enough to render him cynical of any of life’s illusions. His world-weary eyes survey with precise intuition the characters at play in a royal court brimming with duplicity and covert machinations. But say what you will about his intentions, Cromwell was perversely loyal to those whom he pledged allegiance (though some may argue only as long as it served his purposes; he quickly threw Anne Boleyn under the horse when he saw Henry’s interest waning in her). That flagging interest paved the way to the Wolf Hall of the book’s title: the family estate of Jane Seymour, the woman next to be pursued by Henry as the plotting began to rid himself of Anne, with Cromwell as assiduous enabler. Spoiler alerts don’t apply to historical events, so no warning is necessary to reveal that Cromwell was to meet the same destiny he so zealously imparted on others, when Henry had him executed in 1540. It’s just one of those twists of fate that are part of the reason the Tudor period has held a permanent fascination through the ages: the irony of Anne Boleyn, discarded and killed for failing to produce a male heir, but triumphing from the grave by way of her daughter Elizabeth I, eventually one of Britain’s greatest monarchs; the death soon after childbirth of Anne’s successor, Jane Seymour, who managed to produce a boy but lost her life in the process; her son, the future Edward VI, dying at the premature age of 15. In another irony, Cromwell once wrote, “My prayer is that God give me no longer life than I shall be glad to use mine office in edification, and not in destruction.” Not sure many of his victims would have concurred with that thought, but it’s the side of Cromwell that Hilary Mantel chose to explore in Wolf Hall, and it’s what makes both her novels and this series, anchored by a magnificently nuanced performance, so memorable. Wolf Hall (which wraps up on PBS next weekend) is a refreshingly intelligent and thoughtful recreation of a period of history which is so often farcically drawn with reckless disregard of the boundaries between truth and fiction. It’s a treat for serious-minded Tudor aficionados everywhere. 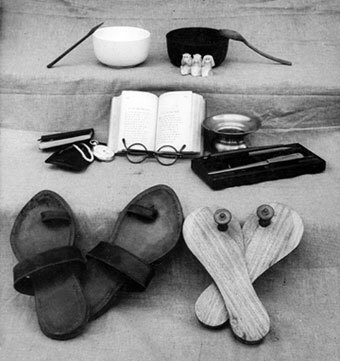 The stark and haunting simplicity of this photograph depicting the last earthly possessions of Mahatma Gandhi was the catalyst for Experiments with Truth: Gandhi and Images of Nonviolence, a wide-ranging examination of the history of civil disobedience which opened earlier this month at the Menil Collection in Houston, Texas. “When I saw this picture [while] reading Gandhi’s autobiography, for me it became like a testament, like a poem. And I never forgot it,” Josef Helfenstein, director of the Menil Collection, recently commented. The exhibition, which coincides with the 145th anniversary of Gandhi’s birth, features a special focus on photography, and uses art and artifacts to depict symbols of protest throughout time, as well as the contributions of icons from Abraham Lincoln to Martin Luther King, Jr. and Nelson Mandela, who inspired nonviolent movements that reverberated around the world. Experiments with Truth runs through February 1. 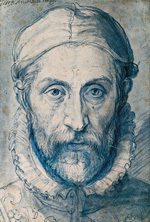 New artist alert: well, actually not so new — hails from the 16th Century, in fact — but you’d be hard-pressed to guess that. 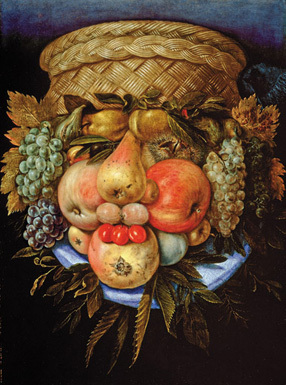 I delved into the background of Giuseppe Arcimboldo (born in 1526 or 1527 in Milan), an Italian iconoclast whose legacy is still surprisingly vibrant and creative, after running across an installation by American artist Philip Haas that’s on display at the New York Botanical Garden throughout this summer. Haas’ 15-feet-tall fiberglass creations are inspired by Arcimboldo’s portraits of the Four Seasons, with faces constructed of such items of nature as fruits, vegetables, and flowers. 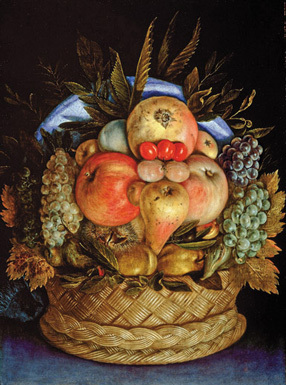 What’s neat about Arcimboldo is that the jury is still out on whether his paintings were either products of a quirky sensibility or the fruits (excuse the pun) of a deranged mind. Many consider him to be a Methuselah-like forerunner of what’s now known as Surrealism, which makes his output, that coincides with the strict classicism of the High Renaissance (he’s labeled a Mannerist), seem even more cutting edge for the time. Throughout his years at the court of the Hapsburgs, Arcimboldo didn’t shy away from mocking the monarchs to whom he owed his employ. The Holy Roman Emperor Rudolph II shows up as the ancient god of growth and the seasons, Vertumnus, and his subtle critiques of the upper class underlie such works as The Librarian. Whether madman or genius, old Arcimboldo definitely met one criteria for what can be considered art in any form: providing a new way to see. 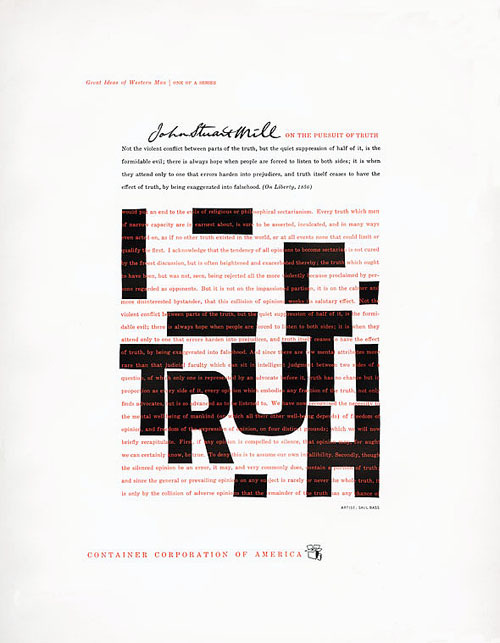 Intelligent advertising may seem like an oxymoron these days, but a remarkable print campaign from a long time ago still impresses with its creative uniqueness as well as longevity. With the unlikely sponsor of Container Corporation of America, which was clearly thinking outside the box (couldn’t resist), the series, called “Great Ideas of Western Man” ran over a period of almost three decades (1950-1975) and matched artwork from a number of illustrators and designers with thought-provoking quotes from an array of philosophers, writers, scientists, and other cultural icons. 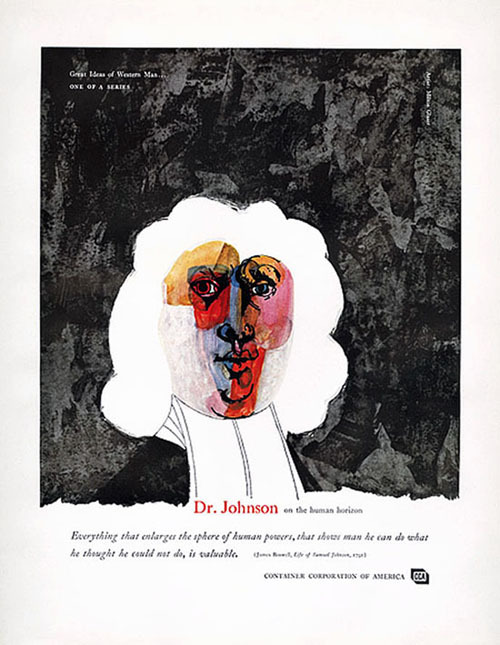 The goal, apart from the simply inspirational aspects, was to introduce the American public to the work of artists — such as Milton Glaser, top, and Saul Bass, below — with which it would otherwise have remained unfamiliar. Ahead of their time in not underestimating the discernment of consumers, the ads are considered a watershed moment in marketing history, as they bore no corporate message beyond the inconspicuously placed CCA name in small type at the bottom. 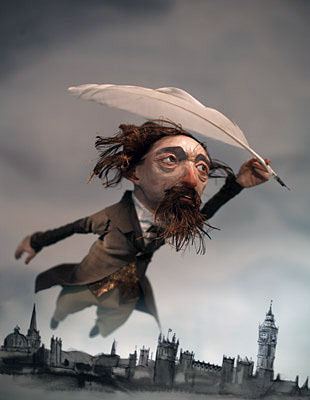 This year’s bicentenary of the birth of Charles Dickens, who defined the era he lived in much as William Shakespeare did in his time, is being universally celebrated with a host of special events, exhibitions, performances, and festivals that highlight the novelist’s deep influence on the society and culture of the Victorian age. His impact on the visual arts was also significant, and is examined in a UK exhibition titled Dickens and the Artists, which runs through October at the Watts Gallery in Guildford, Surrey. 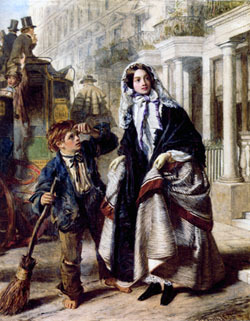 Though not household names to us now, painters like William Powell Frith uniquely interpreted the richly textured world of Dickens’ imagination in tableaus inspired by the writer’s depictions of life on the streets of London. Frith’s Crossing Sweeper (1893), below right, is at immediate glance a microcosm of the Dickensian scenes we are all familiar with; other Frith works, like Night Haymarket (1862) are likewise awash in the moods, colors, and subtle pandemonium that so memorably permeate the Dickens oeuvre. Dickens himself had a reputation as a savvy art critic, often outlining his thoughts in the magazine he edited, Household Words, and commenting on his interest in both contemporary artists, as well as the Old Masters, on his many tours of Europe. His passion for the theatre is often overlooked in light of his literary success. Little wonder his genius continues to resonate — 200 years on.